"We have more ideas [for our projects] than we actually have time or energy to accomplish," Jemmy Joe said. Olympia Pop Rocks debuted in March 2015 with a focus on Olympia’s art and culture. 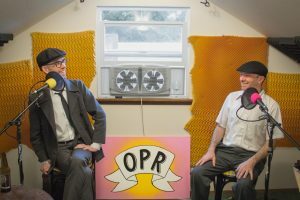 They search out interesting people to talk with during their podcast, including Tush Burlesque Dancer Kymberly Zyl, Olympia homeless advocate Meg Martin, and even another podcaster, Julie Kinn of The Station Wagon. 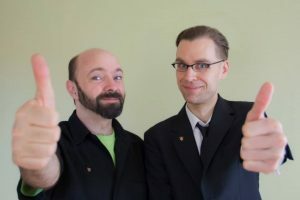 From their simple studio equipped with a few microphones, a laptop, green screen, and of course, boxed wine, I chat with Jemmy Joe and Guire in the upper level of their Olympia home. 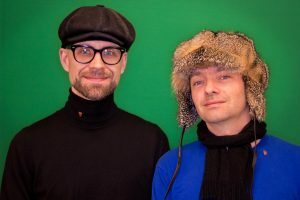 The podcast began as a way for the two friends to stay connected with each other. Previously, they had worked on musical projects together but eventually their tastes grew apart. Jemmy Joe had thought of the name (and the theme song) when he was 16. “We’d both fallen in love with podcasts as alternative media and decided that we needed to do a podcast,” said Guire. “We have more ideas [for our projects] than we actually have time or energy to accomplish,” Jemmy Joe said. “It was good for me to actually learn more about what’s happening. I’m pretty new here so it was nice to meet new people who are doing something cool in town,” Jemmy Joe said. Guire goes after particular people that he admires and wants to learn more about what they do. For example, they talked with jazz guitarist Vince Brown, and it was one of the most interesting conversations they’ve had. Guire (left) and Jemmy Joe (right) record an episode of Olympia Pop Rocks from the upper level of their Olympia home. Photo courtesy: Olympia Pop Rocks. “I don’t think we’ll ever run out of people to talk to,” Jemmy Joe said. Olympia is a special place to Jemmy Joe and Guire – neither of them are natives, but just from talking to them, I can tell that Olympia will be their home for a long time. When he’s not recording podcasts, Jemmy Joe plays classical guitar. He recently recorded a rendition of “Pure Imagination.” He also has a YouTube channel where he vlogs and plays music. “I’ve devoted my life to creative pursuits,” he said. Guire has an electronic pop group called Xohno that he works on with his friend Donna Watson. Watson does the vocals and Guire produces the music. He also loves writing fancy letters on nice paper and ink. Guire (left) and Jemmy Joe (right) record two Olympia Pop Rocks episodes each month. Photo courtesy: Olympia Pop Rocks. Currently, they’re really excited about a new video project called “People of Olympia” where they feature the unique stories of Olympia locals. They’ve also launched a Patreon campaign to help fund their projects. They’re really excited about the support they’ve gotten so far, and it’s allowed them to expand their project. Their future plans? They’d love to make their studio a place for other creative folks to come record podcasts or videos. “We’d like to turn into a production house,” Guire said. During this interview, Jemmy Joe and Guire invited me to be in their podcast. Check their website to listen.